This sounds easy, of course. What’s difficult about reading at your local coffee shop? In fact, that’s a great way to start. However, serious students know they often have to take more than a book with them and plan to stay awhile. They come to recognize whether the silence of the library stacks works for or against their concentration, or whether the background music in a local bakery is disruptive or “just right”. They learn the right level of people and chatter around them and whether a cup of tea should be available to keep them going. They learn to keep their laptop batteries charged and share outlets with folks at the next table. They learn to be customers — to buy food or drink to pay “rent” on the table — and to tip servers who keep the third place humming. Is it better to be in a third place with excellent wifi and the research it enables, or are there times to segregate yourself from tweets and updates so you can focus on math problems or heavy reading? It’s whatever works for you and your assignments, of course! I have always introduced my homeschooled teens to the beauty of learning, thinking, and socializing in a third place. They have each found their favorite atmospheres and learned what tools to have on hand to have a pleasant and productive study session. When the teens move on to college, they already know how to seek and use a third place that will let them get away from a roommate with too-loud-music or too many visitors or too much partying. They know how to put themselves in a physical environment that is just stimulating enough with breaks and occasional conversation, but not so stimulating that it’s impossible to focus on thinking about a project or reading something technical or deep. 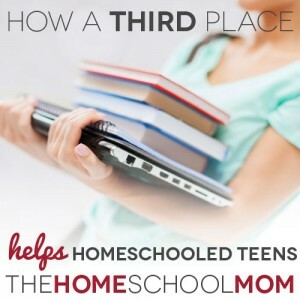 Using third places can also be a rite of passage for homeschooled teens. In many communities, a responsible older son or daughter who is nonetheless not of driving age can be dropped off at a library or coffee shop for a few hours respite from little brothers and sisters — and even from Mom and Dad. While it feels like a small thing, it is a little shot of independence and peace and quiet, and it will help your getting-older young teen learn how to find and work in a third place. There’s also the value of Mom getting a little third-place time across the table from the teen. I’ve enjoyed my hours of reading and writing while one or more of my sons worked on his own projects in a little cafe or restaurant, which has given me some of that much needed “me-time” that homeschooling parents seek. We’re together, I’m modeling how to be a reader/writer/thinker — but I’m able to be in my own head. This is not so different than when I once took my preschoolers to the playground, armed with my own bag of books and papers to peruse while they were running and climbing. Plus, at the third places we like, I get my cup of tea! 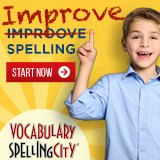 Using a third place for learning and thinking is yet another way to take the “home” out of “homeschooling.” Many homeschoolers joke about how seldom we are home when we are homeschooling elementary age kids because of the many activities the kids participate in. I’m happy to report we can continue this tradition during our kids’ teen years, as they take classes and volunteer in their communities, participate in local arts and sports programs — and as we give them opportunities to become comfortable studying in third places. Loved this article. I appreciate the reminder that we must learn how to learn in places other than our comfort zone at home. This article has inspired me to consciously address this issue with my teens. 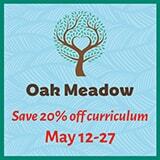 Not only will it be a learning experience for them, it’ll bring a breath of fresh air into our homeschooling journey. Thanks! Reading your latest post about 3rd places while enjoying a chai latte at Starbucks and watching my 13 yr old daughter at a separate table finish up her math work. Very timely article! Third places are a must but I must admit I never really thought about the benefits of all the places we end up parking and doing our “schooling.” Thanks!